Arch-topped windows and striking gables give character to the Lennon home plan. Inside, cathedral and tray ceilings in the living spaces give this home plan a spacious feel, with French doors and large windows facing the rear of the home. A coat closet and mud room off the garage help keep messes hidden, and the laundry room includes counters for extra workspace. The master suite features a tray ceiling, screen porch access, and two walk-in closets in this home plan. 1st Floor: 2324 Sq. Ft. 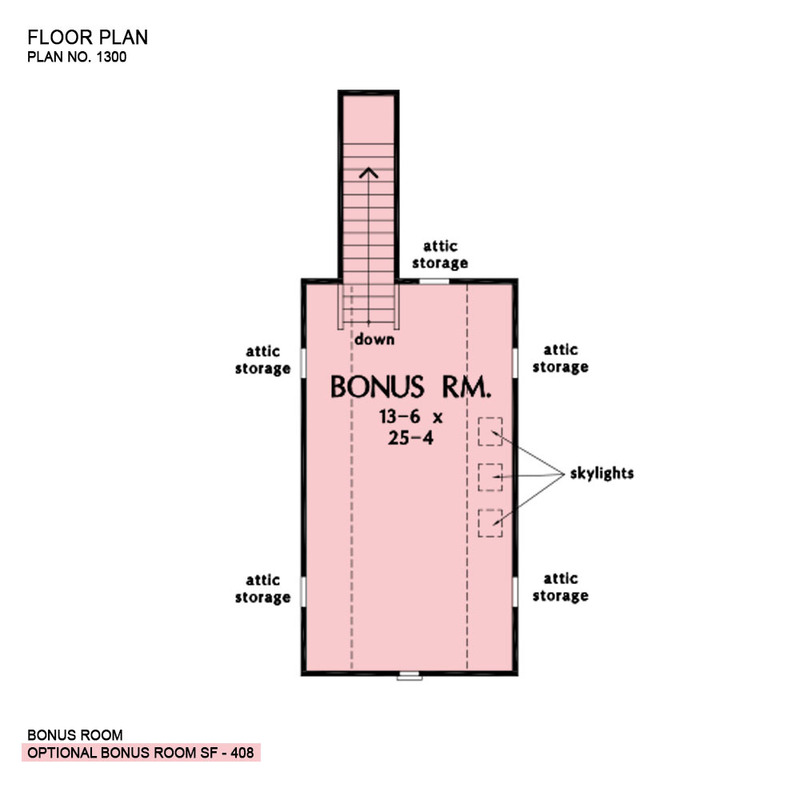 Bonus Room: 408 Sq. Ft.
Porch - Front: 175 Sq. Ft.
Porch - Screened: 241 Sq. 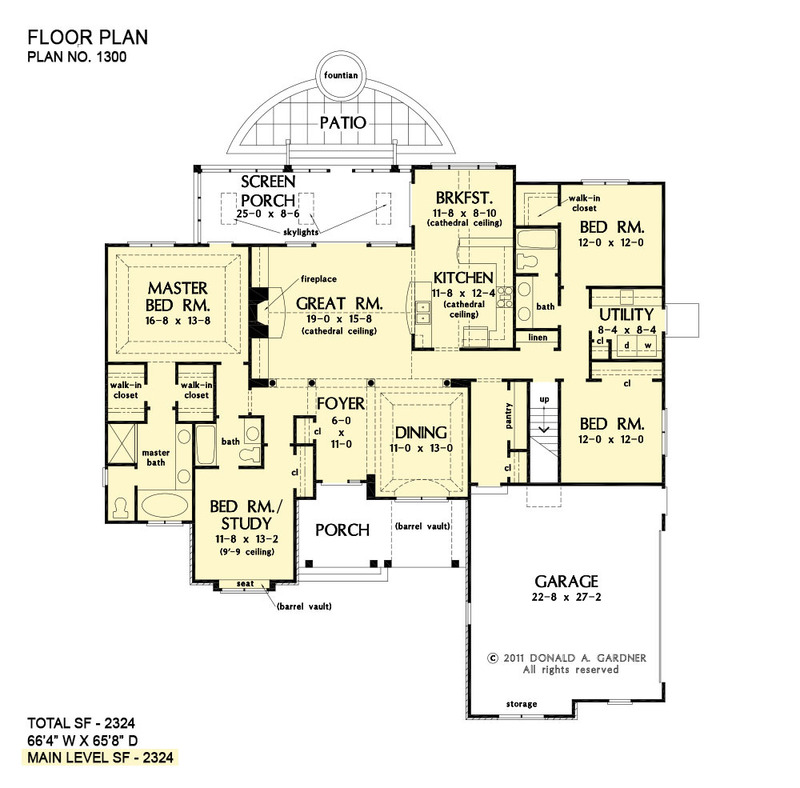 Ft.
House Dimensions: 66' 4" x 65' 8"
Great Room: 19' 0" x 15' 8"
Master Bedroom: 16' 8" x 13' 8"
Bedroom #4 : 12' 0" x 12' 0" x 9' 0"
Bedroom / Study : 11' 8" x 13' 2" x 9' 0"
Bonus Room (Vaulted): 13' 6" x 25' 4" x 8' 0"
Breakfast Room (Cathedral): 11' 8" x 8' 10" x 15' 4"
Dining Room (Tray): 11' 0" x 13' 0" x 11' 0"
Foyer : 6' 0" x 11' 0" x 9' 0"
Garage : 22' 8" x 25' 4" x 0' 0"
Garage Storage Bay : 12' 0" x 1' 10" x 0' 0"
Great Room (Cathedral): 19' 0" x 15' 8" x 17' 0"
Kitchen (Cathedral): 11' 8" x 12' 4" x 15' 4"
Master Bedroom (Tray): 16' 8" x 13' 8" x 10' 6"
Porch - Front : 20' 4" x 8' 0" x 9' 6"
Porch - Screen : 25' 10" x 9' 4" x 9' 0"
Utility Room : 8' 4" x 8' 4" x 9' 0"
Patio - Rear : 27' 0" x 12' 0" x 0' 0"